This is a crossover of sorts with the Highlander universe, though only one character from that universe makes an appearance. As it deals with Highlander-style Immortals, there is temporary character death of the main character, and permanent deaths of other immortals who challenge him. In addition, there is an off-screen (Permanent) death mentioned of a canon character. After the events of Becoming, Xander leaves Sunnydale and spends the next several years drifting from place to place, hunting and being hunted in equal measure. 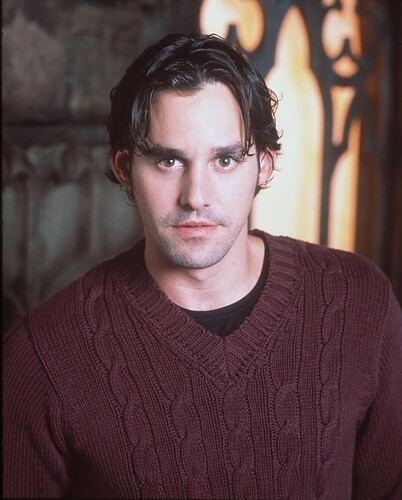 Xander Harris stood still as Buffy continued yelling at him, her words pain-filled, her eyes watery. He didn’t say anything. What could he say? She was right. She may not have known the reasons why or even been able to understand them if she had, but that didn’t make the truth of them any less. Her eyes were red, from crying, for who knows how long. Xander hadn’t wanted to have this conversation, now, when the loss of Angel was still so fresh. It didn’t matter that she had lost Angel months ago, and it was only Angelus who was gone now. Buffy was angry because now there was no hope. There was no chance of getting Angel back, not now that she had sent his evil counterpart to Hell. Xander knew that she had wanted that chance, needed it really, and that now that it was gone, she needed someone to blame. He was the lucky recipient. Maybe she was just lashing out; maybe some part of her understood what he did, though not why; Maybe in time, she’d forgive him. Unfortunately, it wasn’t time either of them had. Buffy may not be aware of the why’s behind Xander’s decision to remain silent. A decision that got Angelus sent to Hell that much sooner, but Xander did. He knew what he had done, and he knew why he had done it. Xander may have been a lot of things, he may have been cowardly, and dorky, and goofy and even a bit lost, but he’d always known who he was. He’d always known himself, inside, where it counted. And he knew himself now well enough to know that he couldn’t stay here any longer. Not now, knowing who he was, and knowing what he did and why. Buffy stopped her ranting and took a deep breath, squared her shoulders and looked directly at Xander. “I don’t know you anymore. Maybe I never did.” Her words, softly spoken, tears rolling down her face were like a knife in Xander’s gut. Not because he had hurt her, though there was some of that, but because of the accuracy of her statement. She never had known him. Had anyone? “No, you didn’t,” Xander answered although it wasn’t really required. Xander disappeared out of the door, leaving Buffy to stare after him, tear tracks staining her cheeks. The pain inside of her was so strong. Pain for what she had done to Angel. Pain for the realization that Xander, one of her best friends had caused it to happen, in part. If he had told her what Willow was planning, she might have been able to save Angel. Maybe. But she wasn’t given that choice. Xander had taken it away from her. There was also pain for the fact that Xander wasn’t sorry for what he had done. He had never apologized. He didn’t even seem to realize that what he had done was wrong. Buffy shook her head. She never understood Xander’s hatred for Angel. Even allowing for the fact that Angel was a vampire, he had helped them on several occasions. There was no reason that Xander should feel the way he did. It didn’t matter anymore. Angel was gone now. She’d sent him to hell. She’d never see him again, except in her dreams. Life goes on, and now it would go on without Angel, and without Xander. She had closed that portion of her life. Angel was gone, physically, and even if Xander was still around, she wanted no part of him, not anymore. Not after what he’d done. She’d survive, she always did. Xander left the Summers’ house and went straight to see Willow. She was the one person he had to say goodbye to. The one person that he owed that to. She would understand, she always did, and always would. He knocked on the door and after a few minutes, it opened to reveal Oz. In his typical way, Oz just stepped aside to allow Xander entrance. Xander found Willow in the living room, sitting on the couch, the wheelchair the hospital had sent her home with was parked in one corner of the room. Xander walked the short distance and sat down next to her, taking one of her hands in his own. He noticed that Oz hadn’t followed him in, no doubt allowing them privacy. He appreciated that. “I have to. I have no place here, not anymore.” He squeezed her hand. “Xander.” Willow sighed as she squeezed his hand tightly. “What about school?” She asked, hanging onto the last thing that would tie Xander to Sunnydale. She knew mentioning his parents was pointless, and more likely a reason for Xander to leave than stay. Willow nodded, knowing the truth of this statement. Things had been really bad this past year for Xander. She had known that he would be leaving before too long, she had just hoped to postpone it as long as possible. “Buffy will come around,” Willow said quietly, not certain of that fact, but hoping it was true. “I know,” Willow said softly. She didn’t completely understand all of Xander’s reasoning behind not telling Buffy she was trying the soul restoration again, but she knew Xander well enough to know that there was a reason for it. Xander was very complex. He always had been. There were things about him even she didn’t know, things in his past he wouldn’t talk about. Things she wasn’t even sure she could handle hearing, even if he would talk about them. So much had changed for them when they met Buffy. Willow had instinctively known that she had found her place. Fighting evil. Doing what she had to do to make the world a better place. Although Xander was a part of that; A part of the world, and a part of her world, Willow had known things were different for him. Nothing was ever so simple, so cut and dry. He lived in a darker place, although she was loathe to think about it. It was true, and she knew that the day would come when he would have to find his own way. It seemed that day had come. Xander bent down and gave her a kiss on the cheek. “I love you. Take care.” He started to move back towards the front door when Willow spoke again. Xander closed the door behind him and leaned against it. “Always.” He whispered before moving away. The sooner he got out of Sunnydale, the better. For a while, he just wandered around. From town to town, going from one odd job to the next, never staying anywhere long enough to put down roots or even get to know the locals very well. Sometimes he’d find himself a little side action with the local demons, but mostly he kept to himself. Once a month he sent a postcard to Willow. He kept it brief telling her he was fine, and that he missed her. It was over a year before he actually spoke to her on the phone. He hadn’t been surprised to learn that Buffy was never the same after Angel was gone. She never forgave Xander for his part in what happened, and without Xander there to be angry at, she had transferred her rage to Willow. Xander read between the lines in their sole conversation. He knew how much Buffy’s pain and anger had hurt his friend; but as much as he would have liked to have said or done something to help, he wasn’t sure he could. Not anymore. That part of his life was over now, and he wasn’t sure if he would ever go back; If he could ever go back. He had been on the road for almost two years when he stopped in a small town in Pennsylvania, just south of North Hampton. He had never been traveling to any particular place and didn’t have any way of deciding where to go, just so long as he kept moving. He had stopped working the daylight jobs and found himself working for the more interesting, and profitable demon population. “Hey, what’ll you have?” The bartender asked as Xander slid onto one of the stools. The bartender brought Xander his soda and went to wipe down the far end of the bar. After a few seconds, he came back and watched Xander fiddling with his glass. He left the bar and walked back to his motel room. The bartender was right. It was time he left. He’d been here too long. One day he might find a place he liked well enough to stay, to call home, but Xander doubted it. He didn’t have a home anymore. He probably never had. The day Xander turned twenty was hot. Really hot, over a hundred and ten degrees. He couldn’t sleep and spent the day down in the sewer system that ran through the town he was passing through. The smell was nasty, with the oppressive heat causing everything to smell worse. After finding a nest of extremely obnoxious vampires, and disposing of them, Xander was soaked in things he’d rather not contemplate and took a long hot shower before walking to the pub down the street. However, like most things in his world, plans were apparently of no consequence. He had almost reached the pub when he heard a strange sound from the alley behind the building. A decidedly inhuman sound. For a split second, Xander thought about ignoring it. But only for a second. Sighing to himself, he turned down a side street he knew led behind the pub. He was only slightly surprised by what he found. Three Vorash demons, apparently foraging for food. They weren’t as dangerous as some other demons he’d run across in his time, but they weren’t exactly harmless either. Besides he was in a foul mood. The large and no doubt older of the three snarled and stalked towards Xander. “You want to play?” Xander moved away, ducking out of the demons reach. The move caused the other two, smaller demons to jump into the fray. Xander used all of his strength to fight off the two smaller demons while ducking the larger one. They circled each other for a while, the demon growling at his inability to catch Xander. Xander saw the other two demons trying to grab him, without much success. Xander took the dagger he kept in his boot and used it to cut a wide gash in the arm of one of the smaller demons. Dark blue blood started to spill out, causing the injured demon to move away. Xander jumped out, stopping the demons retreat. “What? Did I hurt you?” He grinned a little and gripped the blade’s handle tighter. ‘Maybe I should try again.” He ran the tip of the blade across what passed for the demon’s neck, causing more blood to spill forth, just seconds before the demon fell to the ground. The large demon growled louder and finally caught Xander, grabbing him across the throat. Xander gasped and used his free hand to throw the dagger at the other demon. The demon never saw it coming. One minute the demon was watching his injured comrade lying in a pool of his own blood, the next the sharp blade was embedded in what appeared to be his stomach. It apparently was more than his stomach though. Two seconds later the demon keeled over, landing on top of his brethren, leaving only the larger of the three. Xander moved his eyes to that of the surviving demon, who still had a grip around his throat. The demon’s red eyes glared angrily at him, grunting something in his own tongue. “What are you waiting for?” Xander rasped out. The demon stared a moment longer before speaking. “You are not afraid?” His voice was thick, gravely and only barely understandable. The demon didn’t respond, his taloned fingers gripping Xander tighter until he lost consciousness. The demon let Xander’s body fall. He was still alive, but barely. Holding the body down with one foot, in case the human was stronger than he looked, the demon thrust his large taloned fist through Xander’s chest. He squeezed. When he pulled his fist out again, it was covered in blood…and Xander’s heart had stopped beating. He sat up slowly, almost afraid he’d find some vital part of his anatomy missing. Looking around carefully, he was only mildly surprised to find the bodies of the two demons he killed. The larger one had obviously survived. The last thing he remembered was the demon’s large red eyes staring at him, and knowing, without a doubt that he was going to die. He hadn’t been overly alarmed or even very afraid. Death seemed to be inevitable. It had seemed that way in his other life, back in Sunnydale, and seemed even more so the way he had been living these past few years. Only apparently death wasn’t so inevitable. He stood up, a little disoriented and tried to stake stock of his surroundings. He was still in the alley behind the pub. He must have been unconscious for a while. The sun was beginning to rise. Xander looked over his body, inspecting himself for injuries. He didn’t find any. Though if the large bloodstain on his shirt was any indication, there should have been at least one. Taking his shirt off, Xander looked more closely. The skin was completely clear. Shaking his head from the strangeness of the situation, Xander moved out of the alley and back towards his motel room. He wanted to take a shower, change his clothes and get as far away from this town as possible. Willow sighed heavily as she looked through the day’s mail one more time. “Nothing?” Cordelia asked as she sat down next to the redhead. “Maybe he doesn’t know how to reach you. You haven’t heard from him since we left Sunnydale.” Cordelia offered. “No. If he really wanted to find me, he could. We’re not exactly hiding.” She smiled slightly but her eyes were still worried. “Maybe we should talk to Angel,” Cordelia said, just as worried as Willow was. She knew when Xander left Sunnydale it was a sign of things to come; That they would all eventually leave, and they had. But what she hadn’t realized at the time was that they might never see him again. “Yeah, I know.” Cordelia nodded. She knew exactly what Angel would just do. He may have been one of her closest friends, and her boss, but the souled vampire was extremely touchy where Xander Harris was concerned. A subject no one was prepared to bring up unless it was absolutely necessary. “Another Slayer shacking up with a vampire,” Cordelia added. Cordelia stood up, grabbed her purse and followed her girlfriend out the door. “Goodbye Dennis.” They both called as the deadbolt slipped into place behind them. Xander hid in the shadows as he watched two people fighting. He was standing pretty far away, so it was hard to tell, but they appeared to both be human. The weird thing was, it wasn’t like any standard fight he’d seen by people other than demons or vampires. Normally, when mortals fought, it was over money or some other trivial thing, and more often than not it was between a couple of guys who weren’t necessarily skilled in combat. Both of these guys were obviously pretty well matched, and pretty well versed in martial arts as well as in the use of the long swords both carried. Xander was more than a little curious. He crept a little closer, only to become dizzy and back up even further. His head seemed to be spinning, and he closed his eyes. When he opened them up again, one of the guys held the blade of his sword against the other guy’s neck and with a quick movement, sliced his head clean off. It wasn’t that decapitation was so unfamiliar to him. He used it himself more often than not. You’d be amazed at how many things are killed that way. Still, it was unusual for two mortal men to end a fight that way. Anything else he thought of saying was suspended when out of nowhere a freak lightning storm started, seemingly situated right over where the two men had been fighting. The lightning hit the survivor in the chest. But instead of killing him, or even incapacitating him, it seemed to move through him, as if it had a will of its own. The man screamed and sunk to his knees. Xander stared in shock and disbelief until the man looked up, and their eyes locked over the distance. It wasn’t long before Xander had convinced himself that he had imagined whatever he had seen that night. Two men had not had a duel, with actual swords. One of them had not killed the other and then been a victim of a weird lightning storm. That was just too weird, even for his life. Three weeks later, Xander was in another town about fifty miles away and was convinced that he was being followed. He wasn’t sure what led him to that conclusion…exactly. He hadn’t seen any evidence, but…it was just a feeling he had. Or maybe it was the killer headache he’d had on and off for three days. Maybe it was making him hallucinate. Or maybe not. Deciding he was too tired and getting to be too old for hide and seek, Xander led his pursuer into a deserted street. That in and of itself wasn’t necessarily unusual. Xander spent his life wandering from town to town, hunting, killing and maiming demons. Occasionally one got it into his head to attack him first. This wasn’t a demon or a vampire. Though there was something unusual, and disturbingly familiar about him. It was too dark to get a good look, but Xander was almost positive that his opponent was human. And packing a large sword. Flashing on the fight he’d witnessed weeks earlier, Xander made an effort to keep the blade as far away from his neck as possible. The man was a better fighter than he, but Xander had picked up a few things. He embedded his lucky knife into the man’s thigh, causing him to fall down. Xander moved away from the man, content to just leave him wounded, but something made him stop. His eyes traveled over the man’s body, still hard to see in the dark. He saw the man’s grip on the hilt of his sword loosen, and for some reason, he couldn’t quite explain, Xander grabbed the weapon, and before he had realized what he had done, the man’s head was lying two feet away from the rest of his body. In a bizarre repeat of the earlier beheading, a freak lightning storm appeared, causing Xander to see the man’s severed head clearly. It was the head of the man who had won that other fight. It was the last coherent thought he had before he was taken over by the first bolt of lightning. It wasn’t long after he had survived what could only be described as another bizarre event in the life of Xander Harris that he found himself, quite by accident, in an even smaller town on the eastern coast. The town itself had a dwindling population of fewer than five hundred people but was a popular area for the college students of the nearby towns due to both its spot near the shore, and it’s one attraction. A nightclub. The club was in a bad area of the small town as if there were any good areas. Despite the fact that the town boasted more than it’s fair share of demons and vampires, the college students still flocked there. Maybe because it seemed so dangerous. Or maybe because even the local police stayed away. Either way, Xander knew that this particular place was too easy for vampires to pass up. What he hadn’t counted on was a piece of his past to rear its ugly head. He’d gotten to the club early; a full hour before the band was due to come on. Xander spent that hour moving through the throng of bodies, trying to spot anything that shouldn’t be there; anything that might have come looking for a meal, or an unwilling plaything. His search was pretty much a bust when the band started to play. Xander recognized the opening notes of the song and froze. What were the odds, really? The smart thing would have been to get out before he could have been spotted. Instead, he just stood there, staring. Eventually, the song ended and Xander could feel his feet again. He moved through the crowds, towards the door before anything else could happen. If he was lucky, maybe no one who knew him had seen him. Luck wasn’t on his side. Xander had just gotten outside and was moving away from the building when the voice stopped him. “Oz.” Xander sighed as he turned around. Xander nodded, though he wasn’t sure what Oz was talking about, exactly. “But Buffy never did,” Xander stated. “Is Willow happy?” He asked suddenly. Xander took in this bit of information, his expression never changing, though he hadn’t known about either Buffy’s death or Willow and Cordelia’s leaving Sunnydale. “Is there a new Slayer?” He asked though he didn’t much care about the answer. Oz let him go. There was something off about him. Something he couldn’t quite place. Something in his manner, or maybe in the way he smelled. Maybe Xander was right. Everyone did change. The brief encounter with Oz had left Xander feeling hollow. He knew that the news of Buffy’s death should have shocked him. Surprised him. Something. But… he didn’t feel anything. Not anger, or guilt, or sadness. It was almost as if he was dead inside. Now, more than ever, he knew he could never go home. Faith watched as the vampire she’d just staked turned to dust, mentally tabulating the night’s kills. She still had a few more vamps to go if she was going to win the bet she’d made with Spike. And she hated to lose… especially to him. Just as she was about to go in search of more walking corpses, the Slayer heard a noise off to her right. It sounded like a fight. Faith moved towards the sound, making as little noise as possible. Hiding behind a large tombstone, the Slayer took stock of the situation. There was a man a couple of yards away fighting with three vampires. It was dark and she couldn’t see the man clearly, though there seemed to be something slightly familiar about him; but she was almost positive she’d never actually met him. She was usually pretty good at recognizing people. Just as she was about to jump into the fight and help the stranger, she realized it wasn’t necessary. The man had staked two of the vampire’s while she was trying to place what little of his face she could see. She watched him with interest as he circled around the third. It was obvious the guy knew about vampires. He had no trouble whatsoever staking the other two and seemed to do it with the familiarity of one in long practice. He didn’t seem frightened by the prospect of actual vampires. In fact he seemed almost bored. Almost as if his life was one long fight scene; like he hadn’t seen any move that wasn’t familiar. As Faith watched the man fight she felt something she didn’t usually feel towards strangers. She hoped that she would never get that look on her face. The look that said that nothing had any meaning anymore. She hoped that she would never be that bored with existence. That killing became nothing more than an act that had no meaning. She knew that she loved being a Slayer and sometimes she got a little carried away, but she never truly lost sight of they whys. She always remembered who and what she was, and why people like her were necessary. Her predecessor had forgotten that. In all of her anger, and pain over the loss of what she thought was her soul mate, Buffy had forgotten what she was, and let her emotions and guilt get the better of her. One of Faith’s fears had always been that the Slaying thing would get to be too much; that she’d just stop feeling things one day. It was one of the reasons she’d first hooked up with Spike. He may have been a vampire, but he was unlike any vampire she’d ever met; plus he was highly entertaining. And pretty good in the sack. Faith watched as the stranger circled the vampire once more. Before the creature knew what hit him, his head was severed from his body. The vampire turned to dust, allowing Faith a better look at the stranger. He had turned his gaze up to the sky, almost as if he was expecting something to happen. When nothing did, the man shrugged and started to walk away. Faith followed him from a safe distance away, still wondering what it was about him that struck her as familiar. She followed him out of the cemetery and towards a bar at the end of the main street. As he stood at the bar’s entrance, under the yellow lights, Faith got a distinct impression that she had seen his face somewhere before. A vague memory of a photograph tried to surface but she couldn’t quite place it. When she entered the bar, she spotted the man sitting on a stool. She took the seat next to his and ordered a drink. “You mind?” She asked turning to look at the man. He ignored her. He didn’t even acknowledge that she’d spoken, just continued to drink what appeared to be a soda, and stare straight ahead. Faith continued to stare at him, her vague memories starting to crystallize. He looked like Xander Harris. She didn’t know Xander personally, but her friends Cordelia Chase and Willow Rosenberg had pictures of him all over their apartment. Spike had even mentioned him once or twice, always with a sneer in his voice, but Faith was never sure if the sneer was due to Xander or the effect his disappearance seemed to have on their friends. She knew Xander had left Sunnydale, California almost five years ago, and hadn’t kept in touch with his old friends. A fact, which worried Willow and Cordelia and had some unexplained reaction on Angel. If this was Xander, she wanted to know. Her friends should know that he was okay. “You have a name?” She asked abruptly, startling the pervasive silence that seemed to hover over Xander if that was indeed who he was. His dark eyes showed no emotion whatsoever. It was a look that chilled her and didn’t jive with what she did know about Xander Harris. Xander didn’t blink; he didn’t even seem to care what she thought about him, another fact that didn’t make sense if he was who she thought he was. “No,” Xander answered curtly as he stood up from his stool, threw a twenty-dollar bill on the bar and walked away. “He come in here often?” Faith asked as she took a long swallow of her scotch and looked around the semi-busy bar. “He comes into a bar, and doesn’t order any alcohol?” Faith raised an eyebrow, another vague memory tugging at her. She left the bar and walked the few blocks to where she had parked her motorcycle. She wanted to catch up with Spike sooner rather than later. He might find this latest development just as bizarre as she did. “What was he doing?” Spike asked, thinking about the possibility that his girl had in fact seen the whelp. Spike listened as Faith told Spike how she had followed Xander to the bar and about their brief conversation. “Doesn’t sound like ‘im.” Spike said, though deep down he thought it might be the missing Harris boy. “We’ll go back to that bar and see if anyone knows anything.” Spike decided. He wasn’t particularly interested in seeing Xander. If the boy wanted to disappear it didn’t make any difference to him. Unfortunately, not everyone felt like he did. Xander walked into the pub and looked around. He wasn’t in any mood for company after the week he’d had. Thankfully most people were smart enough to stay away when he was in a mood. And these days… he was always in a mood. Actually, that wasn’t completely accurate. In order to be in a mood, one would have to have an opinion one way or another about something, and he just…didn’t. All the days seemed to blend together. All the demons and vampires, and crazy humans wielding swords. It had been a year since that nearly fatal run-in with the Vorash demons. He still didn’t understand why the demon had let him live but had ceased worrying about it. Who was he to argue with some smelly demon? Especially when he was still breathing. Although still breathing, Xander couldn’t really call what he was doing living. Existing maybe, but even that was pushing it. Xander ordered a cold drink and found a quiet booth in the back, barely even remembering it was his birthday. To be honest, he barely even remembered his name. He’d used so many over the past few years. So many names, and identities, and fictional pasts, anything to stop the inevitable question of where he came from. It had been months since he’d written to Willow, even longer since he’d spoken to her. After his run-in with Oz, he hadn’t wanted to chance it. He didn’t know if the werewolf had told the others, and he wasn’t prepared to answer any questions. Although if he was being honest, he would admit that he hadn’t written to her for months, even before running into Oz. If he had, he probably would have known about Buffy’s death. About Willow’s move to L.A. with Cordelia. Besides, there didn’t seem to be anything to say. He had done some looking around and found out that Willow and Cordelia were in Los Angeles, sharing an apartment, and apparently more. That was weird. But it didn’t matter much to him, really. That life was so much a part of his past, he only vaguely remembered it. Some days he’d wake up and forget who he was supposed to be. What name he was using, or where he was. On those days, he’d completely blank his mind out and forget everything. He’d move around almost like an automaton in Futureworld. Not that anyone ever noticed. To notice something wasn’t quite right with him, they would have had to know him. And no one did. Shaking his head, Xander closed his eyes and leaned against the back of the booth, sighing. The pub was air conditioned, but between the heat and the bodies, it wasn’t much cooler than outside. He heard someone slide into the booth across from him but didn’t move. It wasn’t the first time someone had seen him sitting alone and thought he needed company. “I said, get lost!” Xander snapped, still not moving. Xander froze. He knew that voice. At least he had, in his former life. He opened his eyes and slowly lifted his head. “That would be me sire.” Spike said, baiting the boy. He knew Xander and his Sire had history, and though he didn’t know all the details he knew it wasn’t good. Xander left town that night, not looking forward to dealing with Spike. He was a part of his past. A past he didn’t particularly want to catch up with him. He knew Spike was lying, though he couldn’t fathom why. If Angel had somehow made it out of Hell, that was not the way it would play out. 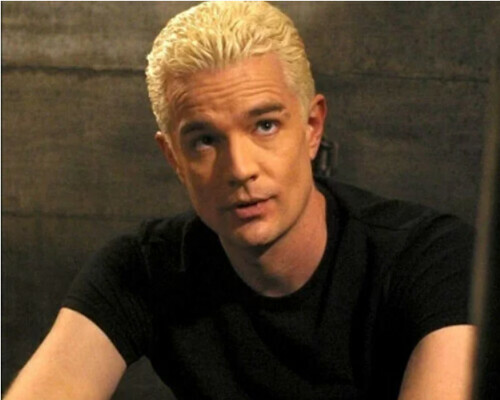 If Angel knew where he was, and wanted him to go back, he wouldn’t have sent Spike. Unless the vampire didn’t remember. That would be better. Wouldn’t it? For the next three months, Xander moved from town to town, weaving through the faceless population, doing what he did best. Killing demons, and maintaining a low profile. He knew he was being followed. It was probably Spike, but he wasn’t ready to talk yet if he ever would be, so he ignored him; Pretended he didn’t know he was being watched. Then suddenly, his shadow was gone. Xander stopped feeling the eyes constantly watching him, stopped smelling the familiar trail of smoke following him. Stopped feeling being watched on the few occasions he actually was out during the day. It was just gone. And Xander breathed a sigh of relief, hoping the vampire wouldn’t be back. He should have known he couldn’t be that lucky. Another few weeks passed before Xander found himself in the corner booth of a small café in California. He couldn’t believe he was actually in California. He thought he’d never come back. True, it was Northern California and nowhere near Sunnydale or Los Angeles for that matter, but anywhere in the state seemed too close for comfort, especially with Xander’s knowledge that Spike wouldn’t give up as easily as he hoped, regardless of who sent him or why he came. After encountering the blonde vampire, Xander wanted to get as far away from his past as possible. He couldn’t imagine why Spike would care one way or another where he was or whether or not he ever came back. And he knew it wasn’t Deadboy. At least not in the way of Angel sending Spike. The vampire wouldn’t do that, souled or not. Still, it wasn’t a reason he concerned himself with. He never planned on coming this far West, however, fate, if there was such a thing, had other ideas. He’d tracked a clan of demons from Reno into Sausalito. What a clan of Mehreshe’ demons would want in Sausalito was beyond him. After he’d taken care of business, Xander was tired, smelly and in no mood to get back out on the road. He checked into a nearby motel and after a hot shower, walked over to an all-night café. Xander had found that although he hated company of any kind, and loathed pointless conversation these days, he couldn’t spend too much time alone. It left him far too much time inside his own head. Some days Xander couldn’t look himself in the mirror, so far removed from that boy in Sunnydale was he. He couldn’t recognize any aspect of what he’d been. Back in Sunnydale, he would sometimes look in the mirror, and recognize what he saw. He knew who he was, what he was. He might have hidden the real truth behind a smile and a dumb joke, but at least he knew the truth. Then, he had a reason to hide. He had Willow, who was always so concerned, making sure he was eating, and that things weren’t as bad at home as she feared. These days, there was no one who would care one way or another. No one to pretend for. And frankly, he just didn’t care anymore, about anything. So long as he kept moving, he was okay. He didn’t have to look himself in the mirror and wonder what had happened to that person he had known. He didn’t give himself the time to stop and think. He didn’t want to wake up one day and realize that he had become something worse than the things he killed in the night. Pushing all his thoughts away, Xander leaned back into his booth and closed his eyes. He knew the chances were slim that he could actually get away with not talking to anyone, not in a trendy café in a town like Sausalito, but he didn’t want to stay in his motel room, and he was so overtired, he knew he couldn’t sleep… yet. So here he was. He had the vague notion that he might have been followed, but he wasn’t sure. It wasn’t unusual, being followed. Mostly he didn’t care. More often than not whoever it was would eventually show themselves, and he was way too old to be playing games with would be attackers. But with the memory of Spike’s appearance so fresh in his mind, Xander was a little leery. He only hoped that if he was being followed, it was by someone he actually knew how to handle. Sometimes he’d be followed by demons who wanted to either hire him or kill him. Sometimes it was both. Other times, it would be the others. The ones who would attack for no apparent reason. When they died, the sky would light up and the memories would come. Memories that were not his own but that he now carried. He never understood who these people were, or how he was connected to them. He knew they were connected, somehow, due to the weirdness that always followed. After the first couple of times, he stopped wondering. It didn’t seem to make a difference anyway. Xander looked up. There was a young man standing over him wearing an apron and holding an order pad. “A coke,” Xander answered, his eyes raking over the café’s customers. “Yes,” Xander answered. The boy was cute. In another life, any other life, he might have flirted with him. But not now. The boy walked away, leaving Xander alone only to come back a few seconds later with the ice cold soda. Xander sat watching the carbonated bubbles moving through his drink until a shadow blocked his light. He looked up, ready to tell whoever it was to go away. He half expected to see Spike standing there. However, it was a face he recognized. It was the girl from that bar in Nevada. He had thought she was trying to pick him up, but he seriously doubted she had followed him over two hundred miles just to get laid. Nobody was that desperate. It wasn’t uncommon for people looking to hire him to approach him, however, those people didn’t usually travel out of their own state. Plus, he had a bad feeling. “Faith.” The girl grinned and sat across from Xander. Xander recognized the name as well as the face. It was the same name as the new Slayer Oz told him about. He nodded slightly, acknowledging her, sensing somehow she would not be nearly as easy to get rid of as Spike if in fact, he had gotten rid of him. “Buffy’s dead.” Faith said almost conversationally. Xander sighed. “The way Spike tells it, Angel’s back. What difference does it make now?” He leaned back in his chair. Xander stood up. “I’m leaving.” He tossed some money onto the table and walked away. Xander stopped, took a deep breath for strength and turned around. He stopped speaking and walked away…again. Faith watched him leave and sighed to herself. Things were worse than she thought. “Well?” Spike asked as he took a drag of his cigarette. Faith had just gotten back, and she didn’t look good. “He’s got serious trouble.” Faith said as she flopped on the bed. “Red?” Spike quirked his scarred eyebrow. “Sounds like a plan to me,” Spike said joining Faith on the bed. “Why not?” Spike asked quietly, though he knew the answer to that as well as she did. Angel stared through his windshield at the motel he was parked in front of. It didn’t look like Xander would be leaving again tonight. The vampire had been tracking Xander for the past ten days, ever since Spike’s phone call, and he was no closer to figuring out what to do. He didn’t know if it would be better to go inside and drag Xander out or to wait until the boy decided to come home on his own. The problem was every hour he spent following Xander confirmed what Faith had tried to tell him: Xander was in serious trouble. Angel barely recognized him. Physically he didn‘t look much different. A little older, a little stronger, a little colder. But basically the same. But in watching Xander, Angel discovered that the differences ran deeper. He saw him fight; demons, vampires, a couple of men who looked human. He wasn’t even going to try and rationalize those fights, or what happened afterward. The conclusions of those fights tugged a vague memory from his brain, a memory he couldn’t quite grasp, but somehow seemed as though it may be important. Angel was however concerned that what the Slayer had observed of him wasn’t even the beginning of what looked to be a downward spiral. Angel had memories of Xander, from Sunnydale. Some were vague recollections, others were crystal clear, of varying degrees in intensity. He knew that regardless of what Willow would want, what Cordelia would tell him was the right thing to do, he was really here for himself. Something had happened back in Sunnydale, that night. Something that had changed everything. He had to fix it if he could. Angel got out of his car. Neither he nor Xander were getting any younger. Xander heard the knock on the door but made no move to answer it. Whoever it was would just have to go away. When thirty seconds after the first knock, several more sounded, extremely more insistent Xander realized they weren’t going away. He climbed off his bed and went to open the door. Angel entered the small hotel room and looked around. It was obvious Xander tended to live out of a suitcase. There was nothing of Xander in the room. No clothes piled everywhere, no trash lying around, nothing to indicate Xander had done anything other than just arrive. “What are you doing here?” Xander asked finally, for once not content with the silence. Xander didn’t comment on that. What could he say? He could doubt Angel’s words, but he knew that at the very least Willow and Cordelia were concerned. He also knew that there wasn’t anything he could say that would allay their fears. He knew he couldn’t go back. He wasn’t the same person anymore. He could only vaguely recall who that person had been. Angel watched Xander closely. Xander’s expression never changed but there was something in his eyes; something he couldn’t quite decipher, but that gave him hope. “We want to help you,” Angel said simply as he sat down next to Xander. “Have you?” Angel asked seriously, watching Xander, almost afraid he would bolt. “I do okay.” Xander shrugged. “Come home,” Angel said again, his voice quiet. “I told you I don’t have a home.” He turned to look at the vampire. “I lost that when you went to Hell.” He didn’t say when I sent you to Hell but it hung in the air between them. “You didn’t send me to Hell. Buffy did.” Angel stated. “Is it?” Angel asked cautiously, placing a hand on Xander’s arm. He could feel the tense muscles moving beneath his fingers, more proof that his visit had affected Xander more than he let on. “Things would be different?” Angel asked somewhat skeptically. He had no doubt that if Xander had stayed things would be different than they were now, but different wasn’t necessarily better. “Do you regret it?” Angel asked suddenly. “You had it in Hell,” Xander whispered. It wasn’t a question. “Why are you really here?” Xander asked abruptly. “You know why,” Angel said quietly. Xander stood up suddenly, moving around the small room as if it had suddenly gotten too small. He couldn’t deal with what Angel was implying and he was seriously freaked out. He knew that odds were good that he couldn’t hide forever, but he couldn’t go back. Not now, not ever. Too much had happened. He knew he could run, but he would be caught. Maybe not right away, but eventually. What would it hurt if he just gave up now? Xander was sure that Angel wouldn’t tell Willow the truth…after. That would hurt too much. Angel watched him, unsure what exactly he was saying no to. “You wouldn’t.” Angel stood up quickly, not really believing Xander would kill himself, but not entirely certain he wouldn’t. “Watch me.” He plunged the weapon into his chest and fell to the ground. Angel watched the blood soak through Xander’s T-shirt in shock. He saw the spreading liquid and swallowed heavily. The scent was strong and had this been another time, another situation, he might have found it…enticing. But this…this was all wrong. Angel was stunned. Not just by the fact that apparently, Xander had been willing to kill himself, but that he had done it, and Angel had done nothing to stop it. Even now, though the scent of blood was strong, he couldn’t seem to wrap his mind around what it meant. Xander was dead. That was… he didn’t know what that was; only that it couldn’t possibly be real. Xander’s heart stopped beating and Angel felt the silence engulf him. He moved slowly over what he couldn’t quite come to grips was a body and not a person. How many bodies had he seen in his long life? Human bodies, demon bodies, some he had killed, some he hadn‘t, but this… this wasn’t like any of them. This was worse. Angel gently tore the blood-soaked fabric away from Xander’s chest and removed the offending blade. He took the T-shirt and wiped what blood away from the wound that he could. The wound in Xander’s chest seemed incredibly small in comparison to the reality of what it meant. He stared at the gash, just over his heart, and watched as tiny amounts of blood continued to flow out. He was still watching; stunned immobile to do anything else when something happened. There was a sound, a slight buzzing, almost like an electrical current. Then, Angel watched as the wound on Xander’s chest began to repair itself. He could see the electrical current now, facilitating the closure of Xander’s wound. Seconds later, he heard Xander’s heart start to beat. Xander was still mostly unconscious but he was undeniably alive. Angel didn’t know what exactly had happened, although he thought he had an idea, but he didn’t have time to test his theory, yet. The sun would be rising in a few hours, and he wanted to get himself, and Xander as far away as possible. Angel didn’t know if this sort of thing had happened before, or whether or not Xander knew, when he killed himself, that he wouldn’t stay dead. He wasn’t foolish enough to believe that whatever this was, it was the only thing standing between him, Xander, and bringing Xander home. He knew that the moment Xander woke up, he’d still want Angel to go. He’d still insist he had no home to go to, and if Angel had any hope of convincing him otherwise, he’d needed to get him somewhere else; Somewhere safe for both of them, until they figured out exactly what was going on. Xander opened his eyes to darkness. For one brief moment, he thought he’d been buried alive. But the movement beneath him belied that. If he had to guess, Xander would say that he was in the trunk of Angel’s car on the way to…wherever. He tried to move around in the trunk, hoping he could maybe jump out when Angel slowed down. Angel had obviously thought ahead. Xander’s hands were cuffed tightly behind his back. Before he could ponder anymore about what do about his current predicament, the car stopped. Xander closed his eyes and listened. He heard a car door open and shut and the sound of footsteps crunching on gravel; then the sound of a key in a lock and the trunk was popped. Angel leaned in and pulled Xander out of the trunk and hoisted him over his shoulder. Xander opened his eyes carefully and looked around. They appeared to be at a cabin in the middle of nowhere. Angel opened the cabin’s front door and brought Xander inside. He put him on the bed and attached Xander’s cuffs to one of the bed’s posts. Xander appeared to be sleeping, but Angel wasn’t fooled. He stared at Xander for a moment before speaking. Xander opened his eyes and looked around the cabin, avoiding Angel as much as possible. There was a layer of dust covering everything, making it apparent that the place had been empty for a while, at least a couple of years, maybe more. “What is this place?” Xander finally asked. “What are you?” Angel countered. “Nothing,” Xander said stubbornly, looking away. “Bull.” Angel walked out of the cabin and retrieved something from the car. When he had returned he held Xander’s bloody T-shirt and the knife blade. He tossed the items to the bed where Xander couldn’t not look at them. “Did you know this would happen?” Angel asked, letting Xander’s statement stand, for now, and referring to Xander’s miraculous recovery. “Maybe it has something to do with those guys you fought with a few nights ago,” Angel suggested. Angel had a feeling that although Xander may know more about what was going on than he let on, he probably didn’t expect to survive a fatal stab wound. “I don’t know what you’re talking about,” Xander stated edgily. Whether his tension was from the mention of the mortals Xander fought or Angel’s knowledge of them, the vampire couldn’t be certain. Xander swallowed noisily but refused to comment. “What?” Xander hissed, his head snapping up and his dark eyes showing more emotion than he had shown so far. “I don’t think so,” Angel said softly after a lengthy silence. Xander couldn’t help the slight twitching of his lips, so he looked away. “I guess not.” He mumbled. “Tell me what happened,” Angel commanded. “I bet.” Xander grinned slightly. It wasn’t his old grin, but it was something. “I’m not sure how I ended up buried. There wasn’t a body after the fight with Acathla and, well it doesn’t make a lot of sense, but when I got back I was…crazed. I’m not sure how long I was holed up here before I began to sense the passing of time. It could have been days, weeks… or maybe months.” He shrugged again. “Do you remember Hell?” Xander asked cautiously. “How long were you…there?” Xander asked stiffly. “Over a thousand years,” Angel whispered. “How long?” Xander repeated, needing to know exactly how long Angel had been in Hell. “When?” Xander asked, trying to figure out how much time had passed in the real world while Angel was in Hell. “For Buffy?” Xander asked hesitatingly. “Was it true?” Xander asked, almost afraid to hear the answer. “I hated you,” Xander admitted finally, quietly. “No.” Xander shook his head. “No. I never wanted Buffy.” Xander told him. Now it was Xander’s turn to look dubious. Angel shrugged. “It’s been…a really long time since I’ve seen her. I remember her, but…it was a long time ago. “But you remember me.” Xander pointed out. “Yeah, I do,” Angel said, looking across the short distance, his eyes saying more than his words did. Xander looked away. “I hated what you were, but mostly I hated the fact that I didn’t care what you were. I knew who and what you were. And I don’t mean that you were a member of the walking dead.” He stopped and looked up at the ceiling. “Buffy loved you or thought she did. Didn’t that mean anything? What kind of person did that make me…thinking about you, in any capacity? It was just easier to hate you. “Xander.” Angel placed a hand on Xander’s thigh, trying to convey something he couldn’t with words. Angel sighed. He didn’t know how many times he was going to have to tell Xander that he wasn’t responsible before it sunk in. “Why didn’t you? Tell Buffy.” He asked, knowing that Xander wouldn’t let this go until they could move past it. “Did she tell you that Willow’s spell worked?” Angel interrupted. “I can’t go back,” Xander repeated. “You’re not fine,” Angel observed. “I know,” Xander said seriously. “It’s better this way,” Xander told him, knowing the truth of that statement. “Which is?” Xander asked warily. “Why won’t you let me help you?” Angel interrupted. “What’s too much?” Angel asked quietly, filing away Xander’s use of his name. “And you can only do that alone,” Angel stated, knowing exactly what Xander was trying to say, and hating it. Xander moved away from Angel and towards the door. “What about those guys? The ones you killed…will there be others?” He was still uncertain if his theory about that was correct, and he was unwilling to add to Xander’s confusion if he was wrong. Angel nodded, trusting Xander to do what he said he would. Angel wasn’t positive what he was being thanked for, but he thought he had a pretty good idea. “Goodbye Xander Harris.” He whispered as Xander walked out of the cabin. It wasn’t until much later that Angel allowed himself to smile. Xander had said we in reference to finding out about who, or what those men were. Xander watched the vampire turn to dust and idly wondered about the mechanics of dusting a vampire by decapitation. Did it take just that much longer for the body to turn to ash, and how exactly did the body, or the head for that matter know? Shaking his head at his ridiculous thoughts, Xander turned around. He only got a few feet before his head started pounding and he groaned. He recognized the headache as the one he got just before some stranger attacked him. He spotted a man nearly three yards away leaning casually against a large tombstone. Xander approached the man cautiously. “Who are you?” Xander eyed the man carefully, his weapon gripped firmly in one hand. Xander blinked and straightened up a little. The man didn’t appear to be about to attack him, but then again, appearances could be deceiving. He knew that better than anyone. And what did being on Holy Ground have to do with anything? “No one.” Xander shrugged and stepped further away. “No one? Is that a family name?” He asked with a grin. “Know what?” Xander sighed. There were a lot of things he didn’t know. This comment didn’t faze Xander, but neither did it mean anything. He was obviously immortal if what happened with Angel was any indication. He just didn’t know how he got that way. “As in There Can Be Only One.” Adam continued. Xander continued to stare at the man, not sure if the guy was serious or not. Xander blinked. It was official. This guy, whoever he was, wasn’t your run-of-the-mill wacko. No, he was a special breed of crazy person. It was on the tip of his tongue to just deny it all. To tell him it was obvious he hadn’t died. He was still walking, talking, breathing so there had been no death. He should have done just that. He should have walked away. He was suddenly just too tired. He was tired of the constant fighting; the not knowing who or what he was. The demons he could handle. He brought that on himself, hunting them the way he did. He welcomed it. It was the other people that wore on him. The men and women who came out of nowhere, with no warning except the strange dizziness and the weird electricity he could almost feel in the air. They always seemed to be after something. Something he knew he didn’t have, but they always disagreed. He didn’t know what this something was, and honestly, he could care less. Xander knew he had nothing worth killing for. Nothing worth living for either. And yet, they still kept coming. This Adam, whoever he was, seemed to know something. Something Xander didn’t, but perhaps something he should know. Xander sighed and leaned against a nearby tombstone, looking completely at home in a darkened cemetery. “I’m not sure I know what you mean.” He said, somewhat honestly. “You’re not sure?” Adam asked. He’d met a lot of Immortals over the years, and though no two were the same, one thing they all had in common was remembering their first death. His better judgment was telling him to leave this boy to his own devices and go on his way. But there was something about him. Some familiarity behind the eyes that caused him to continue. Xander shrugged. “Not really.” He looked past the man, staring into the distance as if remembering something, or at least trying to. Xander looked completely relaxed against the stone beneath him, though it was obvious to anyone perceptive enough that he hadn’t let his guard down. “Maybe.” Adam acknowledged and looked around, noticing the dawn starting to break. “I know of a monastery not far from here.” Adam offered. The ringing telephone was ignored as Rupert Giles continued to read through a Latin text. He’d been back in England for a few years and although he was technically retired, he still kept busy. His services were no longer needed as a watcher. A new Slayer wouldn’t be called until after Faith died, and Faith wasn’t really Watcher-friendly. She did pretty well on her own, roaming North America at will. Giles spent a lot of his time organizing his extensive personal library, some of which consisted of one-of-a-kind books. Presently, he was translating such a text. The phone’s consistent ringing didn’t disturb the former watcher, as he knew if it were important, the caller would leave a message. Sure enough, after Giles’ standard greeting, the caller spoke. Giles hung up the phone and stared at it for a moment. Samuel Jameson had never been one to over-react. Perhaps there was more to this young immortal. Maybe there was a reason for concern. Xander looked around the abandoned monastery, still holding his weapon though he had dropped his duffel bag to the ground. His weapon was a sword he’d taken off a Laquira demon he had killed after leaving Angel. He’d thought the weapon might be useful since it was obviously old and well-made. Xander had remembered how every mortal he’d fought had carried a sword of one type or another, and its convenience was not lost on him. Xander moved around the large room, his body language showing that it truly didn’t matter. Adam watched him closely and realized that if he really wanted to help this boy, he’d have to give a little. More than he had ever been willing to in the past. “Methos.” He said quietly as he moved towards the boy. Xander looked up. “Xander. Alexander.” He said honestly. “Alexander,” Methos repeated and smiled. He’d known a few in his time. Adam eyed the boy carefully, gauging how he was taking everything he’d told him. The boy seemed to be taking it more calmly than most, causing Adam again to wonder what in this young man’s past had led him to hunt demons and the like. “Where are you from?” Adam asked when it appeared the boy wasn’t going to say anything. “How old are you?” Xander asked suddenly, not wanting to get side-tracked with his boring history. He still had a lot of questions. “Old enough,” Methos answered with a wry grin. “Does it matter?” Methos asked, surprised. Usually, when young immortals tried to guess at an older one’s age, the numbers were quite low. However, Methos would bet that this particular immortal, young though he was, was probably accustomed to dealing with people on a different level. Most demons he had come across lived considerably longer than normal humans. Some were even far older than the average immortal. “No.” Xander finally answered. “Just curious.” He shrugged and looked curiously at Methos. “What makes you think so?” Methos asked, curiously. “I’m sure there’s a reason you’re going around calling yourself Adam.” Xander shook his head. “It really makes no difference to me.” He looked towards the door. He really needed to get some fresh air, think about everything he’d learned about his special breed of immortality. “Fair enough.” Methos nodded. He recognized a person running away from himself when he saw them. “The west coast,” Xander answered suddenly, hoping, strangely, to get the conversation back onto some surer footing. “I’m from the west coast. California.” He wasn’t entirely certain why he was telling Methos anything about himself. He didn’t think Methos really cared about his past any more than Xander cared about his. He stood up from his spot at a stone table and moved towards the door and walked out of the room without another word. Xander couldn’t quite wrap his mind around everything Methos had said. The immortality wasn’t the shock really. Neither was the idea that he would never grow old. He had even gotten used to people he didn’t know attacking him. At least now he knew why. What he was having trouble with was this…prize. This elusive thing all immortals seemed to be after. It seemed to be kind of vague. Who would want to be the last? To basically be responsible for the annihilation of an entire species, secret though they were. Xander wanted no part of it; this hunting each other in some attempt to be the last. He wouldn’t shy away from a fight, but he wasn’t even remotely interested in being the last of his kind or in this elusive prize. What he was interested in was surviving and possibly figuring himself out enough to keep his promise to Angel. Angel was something else he didn’t know how to deal with. His good sense was telling him it was a bad idea…Angel meant complications…it meant dealing with things he’d rather not. But for the first time in a really long time, Xander thought that maybe he wanted the complications. Maybe he needed them. Angel returned to Los Angeles as if nothing unusual had happened. His absence had barely been noticed, a fact for which the vampire was grateful. He didn’t want to lie about where he had been or what he had done, but he wasn’t prepared to tell the others about seeing Xander. Willow and Cordelia would want to know where he was. They would want to see him and try to understand why he stayed away. Angel knew Xander wasn’t ready for that. “Angel, you’re back.” Cordelia smiled at Angel as she shut down her computer. Cordelia shrugged on her coat. “Wes caught Gunn with a Laquira demon. It was pretty weird there for a while, but Wes took care of it. Cut her head right off.” She grinned. “Anything else?” Angel asked as he moved closer to the stairs, deciding he could wait until later to hear about the demon. Much later. Angel took the phone and watched as Cordelia moved towards the door. “If you need me, call my cell, otherwise, I’ll see you tomorrow night. Oh, and Spike’s downstairs…in the basement.” She shook her head and mumbled something as she walked out the door. Angel returned his attention to the phone as whirlwind Cordelia disappeared. “Yes, I just got back,” Angel said, not divulging any information about the reason for his trip. “Not exactly.” The former watcher said vaguely. “Rupert?” Angel asked as he started to move towards the staircase. He wasn’t quite sure why Giles was so anxious to talk to him he called twice, but it had to be important, and he wasn’t entirely sure who was still in the hotel. Spike obviously, but Cordelia hadn’t said if Faith was with him, and although it was silent, that didn’t necessarily mean that Wes and Gunn weren’t around, somewhere. Angel froze in his trek up the steps. “Immortals?” He repeated brilliantly. “As in people, or demons who can’t be killed except by extreme means?” Angel asked, being purposefully vague. Angel furrowed his brow as he continued walking up the steps to the second floor. His theory about Xander seemed to be dead on. “Once or twice,” Angel answered cryptically. “They have a penchant for decapitation.” Angel ventured, not wanting to give too much information away. It was too coincidental that he returned from seeing one such immortal to find Giles needing to talk to him, about immortals. “Tell me about the Quickening again.” Xander said as he came back inside, speaking as though he had never left. “From beheading other immortals.” Xander interrupted. “Weird.” Xander shook his head. Methos felt a small smile quirking the corners of his mouth. This boy was nothing like what he’d come to expect from young immortals. “So…what now?” Xander asked suddenly. “Excuse me?” Methos eyes Xander curiously, uncertain what the boy was asking. “Not exactly.” Methos chuckled at the description. “I think this is the part where I offer to share my wisdom and show you how to defend yourself…how to survive.” Methos offered wryly. “You think?” Xander raised his eyebrows. “I will look into it, Rupert,” Angel promised. Giles disconnected the line and left Angel to his own troubled thoughts. He was stuck in a very awkward position. It was obvious the immortal Giles sought was Xander. However, Angel couldn’t give Giles the answers he was looking for, not if he was to give Xander the time he needed. Given a choice between assisting Giles and doing what he had to in order to protect Xander, the choice was clear. There was nothing he could do now but wait. Xander stumbled backward in a move that was designed to appear as though he had been caught with his guard down. Methos recognized the move and smirked slightly as he moved towards his apparently fallen prey. Xander twisted around just as Methos was upon him and thrust his sword up once, sharply, catching the older immortal in the shoulder. “Very good.” Methos stepped back and rubbed the healing wound as he eyed his pupil carefully. Xander stood up quickly and they began to circle each other. Xander leaned towards his right, but moved left at the last minute, ducking a blow that could have incapacitated him, had this been a real fight. His sword came up to clash with Methos’. Standing up, Xander sliced a gash into the side of Methos’ arm, near his wrist, causing the older man to lose his grip on the weapon. 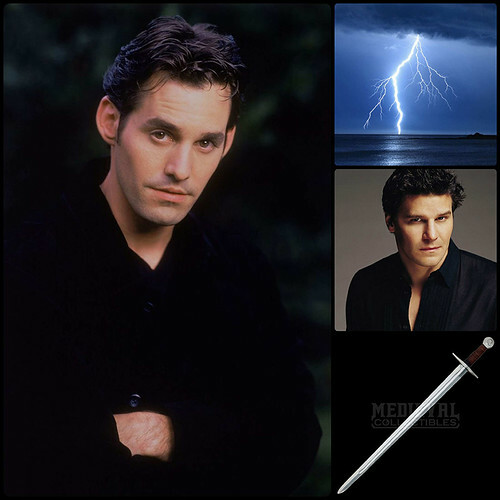 Xander lay the blade of his sword against Methos throat. “Bang, bang, you’re dead.” He whispered. “I’ve learned my lessons well.” Xander bowed slightly, though he never took his eyes off his teacher. They were currently not on Holy ground, and one could never be too careful. “You have.” Methos acknowledged. “So, you’re really leaving?” He asked, referring to the announcement Xander had made that morning. “Oh? What type is he then?” Xander asked curiously, ignoring the obvious dig. Xander still hadn’t learned much about Methos’ life, or who he shared it with, except that his partner, for lack of a better word, was immortal, male and considerably younger than Methos. That in and of itself didn’t mean much. Xander had learned, in these past five weeks, that virtually everyone was considerably younger than Methos. Despite his curiosity, Xander felt uncomfortable asking too many questions since he had yet to share much about Angel or what could possibly become his own personal life. Xander smiled at the image. Methos was probably right. He would like him, whoever he was. He started walking back towards the monastery and the safety of Holy ground. Methos followed him inside and watched as Xander began packing up his few belongings. Once he was done, Xander picked up his duffel bag and opened the front door, setting the bag on the ground outside. He stopped and turned around, unsure what was appropriate to say at this point. He really was out of practice in dealing with people, the past five weeks notwithstanding. 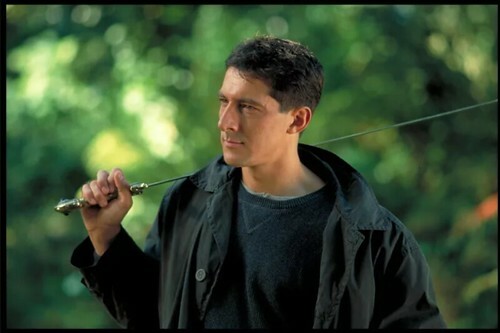 “Where are you headed?” Methos asked, recognizing Xander’s inner struggle. “Someone important?” Methos asked curiously. Even though he’d spent several weeks with the young immortal, he still knew next to nothing about what had led Xander to leave home to begin with. “I don’t know. Maybe.” Xander answered vaguely. Methos smiled wryly as Xander grabbed his duffel bag off the ground, tucked his sword conspicuously out of sight and started walking away. “Oh, Alexander?” He called when Xander was nearly a yard away. “Yeah?” Xander stopped and turned around. Methos watched him leave and wondered if they would cross paths again. Angel stared at the desk calendar Cordelia told him he needed. It didn’t seem to serve much purpose but to remind him how long it had been since he’d left Xander, and cause him to doubt the wisdom of his silence. The telephone’s shrill ring did nothing to change his mood. “Hello,” Angel answered irritably. It was an inside line and he was in no mood to be pleasant. “Angel.” Rupert Giles spoke into the line, not at all put off by Angel’s gruff mood. “Rupert,” Angel responded warily. He’d spent the better part of the last few weeks, avoiding Giles phone calls because he still hadn’t decided what to say. “Rupert,” Angel began, though he wasn’t sure what to say. “Didn’t you?” Giles asked again. “Yes,” Angel admitted with a sigh. Angel blinked slightly, uncertain if he had heard correctly. “How…” Angel couldn’t seem to string two words together. “Rupert,” Angel tried again, only to be interrupted. Again. “Willow doesn’t know,” Angel said suddenly, feeling strangely out of control in this situation. “I won’t say anything,” Giles assured. A brief silence followed before Angel disconnected and wondered what he was supposed to do now. It had been a couple of months since Angel had left Xander and he knew he was running out of time. They both were. Willow and Cordelia were concerned enough that they were almost ready to break their silence and come to him. Spike and Faith didn’t understand why Angel had let Xander go and were threatening to go after him. Again. And now Rupert, who was definitely a wild card, in this situation. Giles stared at the phone for a few minutes before picking it up and dialing the airport. He told Angel he wouldn’t say anything. He never said he wouldn’t visit and see how things were for himself. Xander hopped on his motorcycle and headed away from the safe haven of Holy ground, and the isolation he’d found at the monastery. With the exception of regular sparring sessions and several history lessons, Methos pretty much left Xander to his own devices. Something had happened during those five weeks. Something he couldn’t quite understand and didn’t quite accept, but he thought he might be ready to go home. As the highway passed under his wheels, Xander wondered what would be waiting for him there. Love the idea of Xander being immortal and his love/hate relationship with Angel. Heck, I just love Xander the way you portray him. Xander is so deliciously intense, I don’t know if Willow will accept that she isnt going to ‘fix’ him. I kind of love how he doesn’t react to intimidation or needling or fear though I’d love him to connect with others. His thought about the stupidity of wiping out a whole species is so reasonable. It’s so ridiculous that nobody even knows what they are striving towards. Movies aside, I entertained the thought that it would be something powerful and priceless… In like 100000 BC. Lol.